Shoreline Fruit’s CherryPURE® Tart Cherry Powder provides unmatched value to nutraceutical manufacturers throughout all segments of the market. Our powder leverages the health benefits thought to be inherent in cherries, which are known to contain significant levels of antioxidant flavonoids, known as anthocyanins. Our powder utilizes our proprietary processing technology, resulting in products that contain no artificial fillers or extenders. CherryPURE® Montmorency tart cherry powder is the premier tart cherry material in the marketplace and the only tart cherry source backed by two ingredient specific clinical studies. Led by Dr. Richard Kreider from the Department of Health and Kinesiology, Exercise and Sport Nutrition laboratory at Texas A&M University, in College Station TX., recently completed a sports nutrition based human clinical study focusing on recovery from intense resistance and endurance training. The CherryPURE® used in both of the Texas A&M studies, at a dose of 480mg, is our carrier free freeze dried powder produced from only the skins of the Montmorency tart cherry. Read the full resistance study and endurance study. Completely natural and free of artificial flavors, colors or additives, our cherry powder is the purest, most nutritious, and finest quality available. 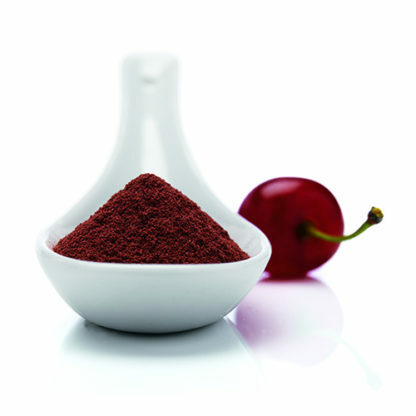 Shoreline Fruit’s CherryPure® Tart Cherry Powder is the ideal choice for a variety of food, beverage, nutraceutical and cosmetic applications. Freeze-dried, 100% natural and additive‐free, our CherryPURE® Tart Cherry (Prunus Cerasus) Powder is a natural source of antioxidants and nutrients. Our unique processing and drying methods maintain the highest levels of the nutrients found in the fruit. Compared to competitive products, our CherryPURE® Tart Cherry Powder contains no added ingredients. Competitive powders may contain as much as 15% fillers, but Shoreline Fruit’s unique manufacturing process requires no processing aids normally used during drying, or any additives to prevent the powder from clumping. The result is a pure tart cherry powder that remains free flowing without artificial ingredients—even in the most humid conditions. The powder is also GMO and gluten free and meets U.S. Environmental Protection Agency pesticide residue allowances.